We’d love your help. 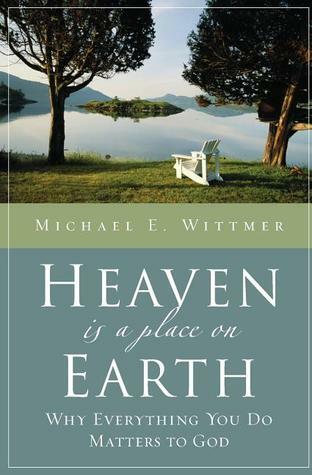 Let us know what’s wrong with this preview of Heaven Is a Place on Earth by Michael E. Wittmer. To ask other readers questions about Heaven Is a Place on Earth, please sign up. Since a friend (who is friends with the author of this book) recommended it to me, I thought I’d give it a shot. I only read about of the book--got a little tired of the author making broad statements, then acknowledging they were too general, as well as using stereotypical examples of gender roles. He also brought in some highly political issues and basically told readers that we should agree with his viewpoints, subsequently brushing off the fact that the issues can actually be much more comp Since a friend (who is friends with the author of this book) recommended it to me, I thought I’d give it a shot. I only read about ¼ of the book--got a little tired of the author making broad statements, then acknowledging they were too general, as well as using stereotypical examples of gender roles. He also brought in some highly political issues and basically told readers that we should agree with his viewpoints, subsequently brushing off the fact that the issues can actually be much more complex than he was making them out to be. He could have done well using some less extreme examples and condensing his arguments. The author’s basic premise is that many Christians focus on the concept of “Heaven” as though it’s the reason why a person should become a Christian--the reason why the gospel should be shared. “The flesh” and “the world” are considered inherently sinful by many. However, he goes through lots of examples to demonstrate that the idea that this world is completely evil and we must take no pleasure in it is actually a Gnostic concept, not a Christian one (look up Gnosticism on Wikipedia). He also goes through some annoying and unnecessary hemmings and hawings to make sure that readers understand what he’s NOT saying, i.e. that we can take pleasure in this world as part of God’s creation, but NOT in any aspect of it that is actually sinful. The gist of the whole book seems to be that that the physical world is not inherently sinful in and of itself, and we shouldn’t focus on Christianity as solely a magic ticket to get people into Heaven. Rather, it should be a life-giving faith that transforms our time here on Earth. “...Anselm replied that God is a unique case. He is not merely the greatest possible being in his category (such as islands), but the greatest possible being, period. And as the greatest possible being, he must, necessarily, exist. Anselm’s point—and this is the staying power of his argument—is that as “that than which nothing greater can be conceived,” God is qualitatively superior to anything in his creation. There is nothing that compares with the greatest possible being. He is in a class by himself—literally.” (Kindle Locations 454-458). Wittmer states that Anselm’s argument is not really his focus, but rather the fact that God is the greatest possible being… then re-states Anselm’s argument, which makes me think it actually is a focus for him. It’s a strange and silly argument, because it’s completely circular. If A is defined as B, and a B exists, then A must exist! It feels kind of like saying that if a banana is defined as the sweetest, most delicious fruit, and the sweetest, most delicious fruit exists, then bananas must exist! However, this is in fact subjective depending on whether or not we believe in bananas in the first place. To someone else, apples might be the sweetest, most delicious fruit. I believe in God. However, if I didn’t believe in God I could easily argue that there could be some alien being out there who might unbeknownst to us fit Anselm’s definition of God, but that wouldn’t necessarily make that alien the God of the Bible as we know Him. i.e. From an agnostic perspective, there could very well be a greatest possible being, but that doesn’t equate that being automatically to the God of the Bible--that presupposes a belief that our particular God exists. So, we exist because God constantly has his mind on us? Where does this idea come from? Does that mean we’re all, ontologically, kind of like the Greek Gods in the Star Trek episode “Who Mourns for Adonis” (except instead of humans believing in them, it’s God believing in us)? Or dreams of the fayth in Final Fantasy X? This is an imaginative thought, but is it Biblical? Weird. Disturbed? At a question being left open? Does he think his readers are so closed-minded and insecure that we can’t handle an unanswered question? Cut yourself some slack, Mr. Wittmer; we know you’re not a Jehovah’s Witness! Oh, barf. Because all wives love chick flicks. He lost me there. I totally agree that we should personally avoid so-called “entertainment” (my quotes) that causes us to sin; however, as a librarian I’m always a little uncomfortable when somebody starts going off on this… people can really be led to sin by anything and everything, so who gets to decide which art leads whom to the most sin? I would have appreciated some clarification as to whether he’s talking about on a personal level or on a larger scale of censorship. i.e. Some random film that one person may find desensitizes them to violence another may find to be a interesting artistic commentary on the human condition. Everyone’s limits are different, so who gets to decide? Another thank you is in order here. Wittmer gets this; he gets it deeply. Although I love my Biblical quote magnets, there is nothing about them that makes me more Christian. Displaying things like this publicly may even serve to alienate further people who have yet to hear the gospel. It’s a way of saying “I belong to this group, you don’t, and you don’t get it either.” How is that a message that Christians want to send? It’s not, or at least it shouldn’t be. Ouch, the stereotypes. I get that Wittmer is trying to say “no wonder our youth are confused,” but he puts forth the idea of a stay-at-home-Dad or a girl who wants to break the glass ceiling with a tone that says those are bad things. I agree that they could be bad things if they were pursued obsessively to the exclusion of balance in life, but in and of themselves I would say they are good things. Is there some anti-feminism going on here? Okay, now he does sound like a Jehovah’s Witness. Sort of. The whole thing about falling asleep in death and paradise on Earth and whatnot. I’m fascinated that he brings that stuff up, actually. Oh, please tell me he did not just go there. I’m rubbing my eyes, but it won’t go away. He just went there. First: Maybe if it suffers from being that oversimplified, it shouldn’t be used for a “quick survey of life-and-death issues”? Second: Does the “worldview that supported the development of modern science” really tout that “God does not exist”? Scientists may make some questionable decisions, but the author seems to be unfairly pitting science against religion here. Third: I would certainly hope that we don’t treat people with “equal respect than we give to the rest of creation,” considering how people tend to treat creation these days. On one hand, I fully believe that people were created in the image of God. On the other hand, I don’t like comparing that too emphatically with the rest of creation. Too many Christians seem to use it as an excuse to treat the rest of what God has made like garbage. I personally prefer to think of humans mattering to God in a unique way rather than mattering "more than" creation per se. Just too much room for abuse in that concept. Soooo… this almost sounds like it is implying that Christians have done something “righteous enough to merit everlasting life,” which is completely not right. I’m sure Wittmer would agree with that, so I’m probably mis-reading his intentions in this statement. It sounds like if “unregenerate people” haven’t done anything to merit everlasting life, then the people who do have everlasting life (...regenerate… people?) have? Weirdly-phrased. Michael Wittmer is a first-rate theologian and writer. He addresses a critical topic with wit and wisdom. Pastors must learn how to integrate these theological topics (goodness of creation, work as calling and fulfillment of the cultural mandate, new earth, resurrected physical bodies, etc.) into our sermons. Not sure who this is addressed to. I and friends, not to mention many of my favorite authors, have discussed this subject together for as long as I can remember. I quit half way through a long chapter on the fall despairing that anything interesting would come from continuing. An excellent treatment of the creation, fall, redemption story and a much needed corrective to common theological extremes. On the one hand the remnants of Gnostic influence leas to the idea that the ultimate goal of the Christian is to escape this world to heaven and on the other hand the Gospel is reduced to simply a social gospel in the here and now. These extremes lead to either an escapist attitude and neglect of the creation and human society or an unhealthy focus on them. Mike Wittmer doe An excellent treatment of the creation, fall, redemption story and a much needed corrective to common theological extremes. On the one hand the remnants of Gnostic influence leas to the idea that the ultimate goal of the Christian is to escape this world to heaven and on the other hand the Gospel is reduced to simply a social gospel in the here and now. These extremes lead to either an escapist attitude and neglect of the creation and human society or an unhealthy focus on them. Mike Wittmer does a great job of balancing the tension between the “already” and “not yet” of the Kingdom, while also explaining how the life to come gives deep significance to our life now. God’s original intentions for His creation and humanity haven’t changed. He never intended for creation to be static, for human culture to never advance and develop. The Fall has hampered and tainted that , but it will ALL be redeemed someday, not replaced. Graham Cooke once quoted his daughter's response to his question about how her relationship with God was lately. To paraphrase, she said that sometimes it feels like her relationship with God is dynamic and it's like she's taking an elevator to the very top floor and meeting with God on a higher spiritual plane. She went on to say that other times she feels like she has to take the stairs and when she can only muster enough strength to get up a couple of steps, God meets her there, as well. Latel Graham Cooke once quoted his daughter's response to his question about how her relationship with God was lately. To paraphrase, she said that sometimes it feels like her relationship with God is dynamic and it's like she's taking an elevator to the very top floor and meeting with God on a higher spiritual plane. She went on to say that other times she feels like she has to take the stairs and when she can only muster enough strength to get up a couple of steps, God meets her there, as well. "I don't want to go to heaven. Not that I'm lobbying for the other place..." With a opening line such as that, I knew I was in for a good, challenging book. I was not disappointed. What are we ultimately created for? Heaven? or Earth? Where do we spend eternity? Heaven? Or a recreated heaven that comes down and "sets up shop" on a recreated, renewed, restored Earth? The biblical story is formative of a redemptive (world)view of all of God's world. This book is a well-written presentation of all of that. Pleased to see that a professor of systematic theology (the author) could keep the "big picture" in mind. Ha! Highly recommended for those weaned on the "Repent! Avoid Hell! Trust Jesus! message. Excellent read covering the basic categories of Creation, Fall, Redemption & Restoration. Accessible.